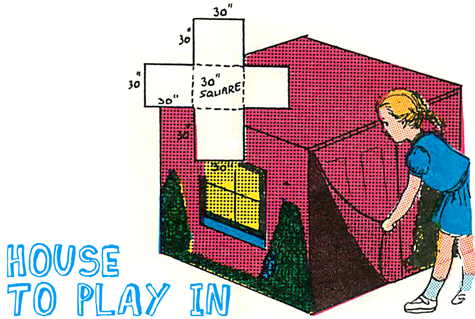 Making & building pretend little houses & buildings is a lot of fun for kids. They can use their imagination and form the most creative little tows & cities right in their playroom. Their own little imaginary world can be right in front of them and they can play pretend for hours. Yet, maybe the most fun part of this scenario is the actualy crafting of these little houses & structures. That is where this page comes in, we give you the know-how and the techniques and you and your child can come up with your own structures. The American Plains Indians lived in tepees, tents made of animal hide stretched over a frame of poles. You can make a small model of a tepee from paper. Fold a large sheet of white paper into a cone. Tape it together from the inside. Cut the tip of the cone off as shown. Now gather some straight sticks, a little longer than the cone, and tape them on the inside. Their ends should extend through the opening on top of the cone. Tape two triangular pieces of paper on the sides near the top, and attach a stick to each, as the picture shows. 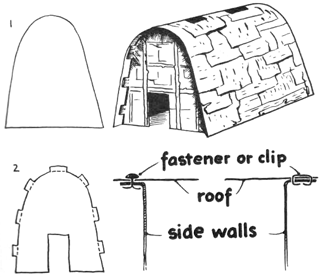 Cut a door in the lower part of the tepee and fold it open. With water colors, paint Indian designs and your tepee is finished. Here is another kind of Indian house that you can make. The Iroquois Indians lived in long houses, made from bark, poles and sticks. You can make a model of a long house from cardboard and stiff paper. Cut two pieces of cardboard in the shape pictured, and then cut flaps in them. These will form the front and back of the house. Bend the stiff paper to make the roof and sides and fasten the front and back flaps to it with metal fasteners or clips. Cut several holes in the center of the roof and a door in the front. Paint the house with water colors so it will look like the bark of a tree and posts. Or use split sticks, putting them on with tape. If you save all the empty boxes around your house, you can soon make an entire city. 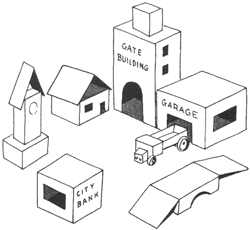 Different size boxes can become houses, tall office buildings, a bank, school, garage and whatever else you like. Cut windows and doors or paint them on. Use different colored paper for the roofs and for signs on stores. Make bridges and parking lots too, and put toy automobiles in the scene. This toy elevator is made using the same principle of the first hand-operated elevator that was built a little over a hundred and fifty years ago. Rinse out a flat-top milk carton and allow it to dry thoroughly. Stand the carton on a table with the pouring spout at the upper right hand corner. With a pair of scissors, cut an opening about 2 inches high, and almost as wide as the carton, at the bottom of the front side. Punch a hole in the little lid that covers the pouring spout. Pull a piece of string, 18 inches long, through the hole and tie a finger loop at the end, as in illustration A. Leave the other end loose. To make the basket, cut a 4 inch square of heavy brown paper. Make a small hole in each corner of the paper square, and tie a short piece of string to each hole. Pull the 4 strings together to make the basket, and join thew in a knot, as in illustration B. 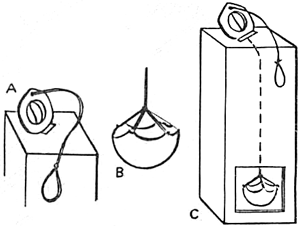 Tie the basket, through the opening in the elevator shaft, to the loose 18 inch piece of string, as in illustration C. Place a few marbles, or some other small objects in the basket. Raise the basket up the elevator shaft to the top by pulling the string through the lid of the carton. The basket should raise and lower easily. If you want to keep a loaded basket at the top of the elevator shaft, wind the string around the lid a couple of times. This is an interesting and worthwhile project for kids who like to design houses and to decorate them. Remove the cover from a shoe box and save it as you will need it later. With a ruler, measure the height of the shoe box. Measure and then cut out, 4 small cardboard panels, 2 inches wide, and 1/2 inch less in height than the height of the shoe box. These will be the room dividers. Fasten the room dividers inside the box with Scotch tape. With a nail, make 2 small peep holes in one short end of the box, as in illustration A. From magazine pages or from Internet or Clipart printouts, cut out pictures of a kitchen, living room, and bedroom. Plan which room in your Peep Show House which will be used for each. Trim the pictures to the right size, and glue them to the sides of the box and the fronts of the dividers of the different rooms. Cut squares of colored blotter paper for rugs and glue in place. Make tiny cardboard furniture for the rooms, as in illustration B. 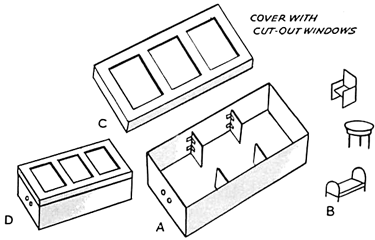 For the skylight, cut out 3 windows in the cover of the box, as in illustration C. Plan the windows so that each one will be directly over a room when the cover is placed back on the box. Glue a sheet of colored tissue paper to the underside of the windows in the skylight. Place the cover on the box, and look through the peep holes, down the hall into the different rooms of the house, as in illustration D. If you like, in place of the magazine cut-outs, you may glue Wall paper to the walls of the house, and in place of making cardboard furniture, you may use miniature toy furniture. Peep Show House. Colored blotting paper makes excellent rugs and lends brightness to the general design. Well there is still a week left until school starts again. The kids are bored...how about making a play house for the kids to play in. This will keep them busy for a long time. Just a card table! Cut pieces of old sheeting as shown. Paint windows, door, etc. on before sewing pieces together. Make a window opening in one side for ventilation. Paint edge with clear nail polish to pr event material tearing. Tack fabric together, and try over your card table before proceeding. If it fits, seam parts together, leaving the door side open for children to enter. How to Make a Shoe Box Doll House Arts and Crafts Project for Kids - Today we will show you how to make a really great toy doll house out of shoe boxes and other materials. This little two-story doll house with its gabled roof can be made in less than a half hour by any handy boy or girl. How to Make a Pilgrim's Log Cabin - Learn how to make a newspaper rolled log cabin...possibly as a Thanksgiving centerpiece for decorations. Making Towns and Villages from Boxes - Make this amazing town / village from cardboard boxes and some techniques. How to Make Cardboard Doll Houses from Boxes for Girls & Boys - This two-story doll’s house is extraordinarily easy to make. It takes shape quickly and yet it is so sturdy that you will be playing with it for months. You will have great fun furnishing the rooms with the simple but real-looking furniture. How to Make Cardboard Tubes Log Cabin for Abe Lincoln on Presidents Day - Well it is going to be February in 2 hours, so I figured that I would put up a Toy Log Cabin Craft Building craft to celebrate Abraham Lincoln’s birthday. Why? Because it is Presisents Day soon. Just use paper and cardboard tubes / rolls and then just connect them together easily. Printable and Foldable Paper House - Simply print the template on regular paper and glue it onto the back of a cereal box and cut it to the size of the paper. 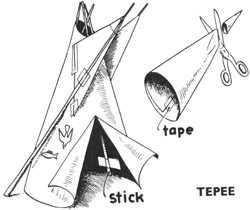 Making Paper Tents - Learn how to make paper tents with the following easy instructions. How to Make Paper Windmills with Paper Modelling Craft Instructions - Today, we will show you how to make a cute paper windmill. Below you will find two printable paper models. All you will need to do is cut and fold the model into the proper shape. Have fun. How to Make Cardboard Doll House Furniture with Old Boxes - Today we are going to show you how to make cardboard doll house furniture, decorations, and wall hangings. This is a great activity for a group of girls at a sleepover slumber party, for girl scouts, or for a boring rainy day. Paper Windmills - Fold these paper windmills with a working pinwheel on it. Folded Paper Churches - Learn how to fold a church out of paper with the following template. Recycled Greeting Card Houses - Make these cute little sewn up greeting card houses.